On this leg we left the Caribbean and are now sailing in the North Atlantic. There was a noticeable change in the weather - it's still warm by my Canadian standards but hoodies and sweaters were worn, especially for night watch. We had very favourable winds and were able to sail the whole way from our anchorage in TCI to the pilot station in Bermuda. We were rushing to beat a gale forecasted to blow in on our arrival day and got the ship up over 10 knots many times. 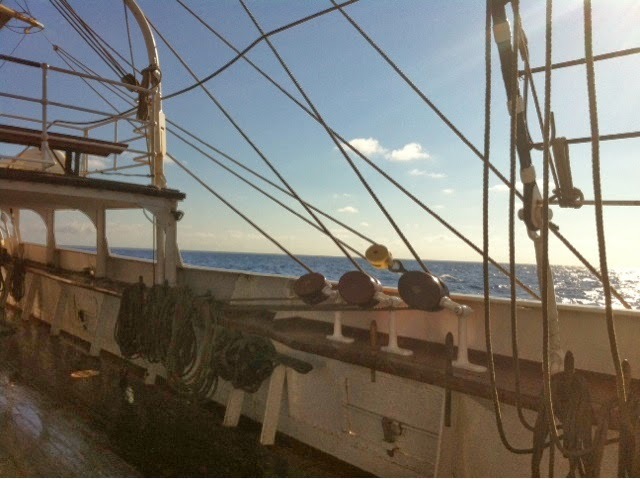 Although we were going along quite quickly the seas weren't that rough and it was quite a pleasant sail. There was a full moon on this leg and I never get tired of watching it dance on the water and through the rigging. I stood the 0200-0400 night watch one day to get some extra moon time. Just as we came into Bermuda a whale (humpback?) breeched a few times and I was on deck to see it. What a great welcome!